This is a thread to try and keep the forums a bit more organized. Please post here all Bugs found and Suggestions I'll try to fix them as soon as I can. I have got for you One bug and Two suggestions. Thanks for the feedback. I've been trying to fix the zombies phasing through the base problem. The zombies need a bit of reajusting overall hopefully everything will run smoother very soon. Both a Day/Night Cycle and Weather are in the works but might have to happen after the initial Playstation release, just trying to get everything as polished as possible first. I just started playing today and loving the game so far. things i have noticed that could use some work. -Zombies find their way through my fence a lot. especially if you hit them while they are trying to break down the fence. -I am having a lot of zombies disappear and appear out of nowhere, which seems to go with some sort of lighting problems im having where it seems dark out, as if it was night time, but the light to dark is patchy and sometimes even comes across as a bit of a strobe effect. -when on the bridge the camera moves to an overhead view, things like the gas gauges from all the cars don't so you cant read them. -The merchant guy makes an amazing road block for the truck and you can get stuck between him and a solid object, making it so you have to sort of wiggle back out and go around him. -The most game ruining glitch i have come across happened just now. I was going for another survivor (the one under the bridge) and while trying to finish his quests a herd shows up so i scoot back to my base. (after going in circles a few time trying to spot the onramp to the bridge) then while im trying to fight the zombies every few seconds the camera slides across the map back to the survivor to see what he is saying ("smash the bottles") after a second or 2 of botton mashing and swearing the camera comes back to my charactor and then after a second its back to that bum under the bridge, making it impossible to beat the zombies obviously and I lost my base. -you cant shoot over a fallen zombies body || I don't believe this is a bug, and I personally like it. Its fun to see a wall of bodies build up outside your base and watching bullets sink into the mass. -I am having a lot of zombies disappear and appear out of nowhere || Is this because of you going into a new chunk? I know when I play Co-Op and the map chunks are more visible, zombies will despawn when leaving a chunk, and respawn when entering one. This mechanic is probably to reduce lag. -The onramp from the city onto the bridge changes its look when you aren't on it || The exit/entrance ramp becomes translucent so you can see under it. I haven't had problems with this yet, though I do know that other players have had issues. Maybe have it so when you go beneath the ramp it becomes highlighted around the edges? -The merchant guy makes an amazing road block for the truck || 100% agree with this. I have gotten stuck on him many times. -the camera slides across the map || I have had problems with the camera sliding back to characters, or panning randomly to my house even though I'm on the otherside of the map and its not in danger. 1. running zombies are able to clip through walls in the cave while you have to take out the zombies in a specific room and cannot leave until they are all dead. 2.Zombies are able to clip through your base walls. 3.When the text come on screen they tend to drag the camera away from the character. ex: when doing the quest for the farmer and your base comes under attack and you run to defend it, the farmer carries on taking and the camera cannot focus on you and gets dragged away. 4.when your base gets destroyed you lose your inventory in hand(no sure if its a bug or a feature). 5.When in cave and you are loading out of the cave you take damage. This is the bugs I have found so far Ive been playing for about an hour and a half and I love it so far, good job. Updates to come on more bugs I find. 1.Able to build during an attack(what ever you where build before an attack you can continue to play that object until you let go of SHIFT). 2.Zombies are able to walk through the campfire. 3.The camera angles go really weird whenever a wave starts and your near you camp. It tends to zoom out and try to become more of a top-down 2D angle and doesn't always come right in that wave, once the wave is complete the angles return to normal. I already suggested it a while back and this was there response to it. Thanks alot for all this feedback and support, alot of this stuff has been tried and didnt work or is already on the schedule. some of your suggestions will definitely be considered. now I did post quite a lot of suggestions and I think that the base moving would fall under "tried and didn't work", there hasn't been any confirmation on this how ever I do think that this isn't on there top to do list(if there is one) as there are many bugs that need to be fixed before potentially creating new ones. ApocNinja is right, sorry to say. Base-moving wasn't really working, so we took it out. However, rest assured that we DO have plans for anyone who gets a little tired of living out in the woods. Thanks as always, and keep the feedback coming! The game is cool but im having only 6-8 FPS in the game idk if its a bug or my computer. Towers are a kind of turret, food is for health and by orbs are bosses. thx for spending time on reading it :D! I'm working on optimizing the game, its running at 24-26 fps on the Playstation4 so I really have to try and optimize as much as I can to get it at a decent level. The problem is not with the Graphics card and youll probably find that changing resolution doesnt affect the fps much. The game has pretty simple graphics but almost everything is physics based so its very taxing on the cpu. I call it "The twin bug" when you play with 2 or more players (you don't have this problem when you play with 4 because you already got the max amount of players.) and change characters you create a new player this mean that one of the players get control of 2 ingame ppls this makes it impossible to change characters with (2 or 3) friends because you can't move to other areas... and when you don't change characters it's rly hard to see who is who (and it makes the game less fun), so maybe you can give each player a diff mark (like color/number.) or/try fix(ing) this bug. Thanks for spending time to this message :D! Ive also had this problem, however it's a pretty easy fix. Just save the game, (make sure all resources on characters are in Home base), and restart DBMB. In the curch sometimes it will not let me go to the next level. -Changing survivors causes damage. I get that starting with a new survivor they wouldn't be full health so you don't just rotate survivors to be invincible, but if you open the "survivors" page and select the survivor you are currently playing with or change to one and back to the other you lose that health. -the pause menu drains stamina, not really a big deal because it comes back so quickly but......ya know. Thank you so much for your feedback and suggestions. Update 1.0.8 added alot of things requsted by the community but has also changed the balance of the game. Please play and let me know any new suggestions or bugs found. I think in the next update the boss should be more difficult, I feel as a boss he's to weak. With the new update the boss zombie of each wave spawns in the center of my base. well it appears to have stopped and i cant recreate it. I really looked for this problem everywhere and can't seem to find why it would ever happen. Let me know if you get it again or if you find a way to recreate it. This also happened to me. The huge boss Zombie spawns inside my base during herds. My cheats don't work. I am doing them correctly, on PC, and nothing happens. I've tried the 3 letter ones, and also the other ones, but they both do not work. It'd be helpful if somebody could help me find the issue here. I was having trouble with them as well. I was able to get them to work using an xbox controller and you have to do them super fast. Project is right, the cheats are definitely made with a gamepad, and I might've made the execution time a bit too quick for many people I'll try and slow down the speed needed to pull it off. Hi, is there anyway of seeing their "To do list" ? I'm hoping to start us up a dev blog to keep the growing community up to date with what's going on on our end of things, so stay tuned for that! I have a problem in the Tutorial (just started playing today). It says I should shoot all the bottles without moving - after shooting everything and anything possible, I'm still stuck in this, no way out, I can only just close the game and completely restart from the beginning. I did not (knowingly) used the ammo cheats - but I found out that the ammo doesn't run out. Is it possible that the tutorial gives you unlimited ammo in that part of the game (because that would really make sense, you have to do something. Would you run out of ammo doing it there wouldn't be any way to finish it). With the newest update you can destroy stumps by whacking them a few times. Clear that field to your heart's desire! The bullet box should be in between 4 tree stumps and when you take a bullet it should stop your movement and only allow you to look around from between the stumps you should be able to shoot the 4 botlles around you, I hope its not a bug you're experiencing, I'll try to locate whats going on. For whatever reason the newest update has interfered with the physics engine. Clipping and body spasms are more common. Also, I found a bug where after placing a spike, my entire base vanished. Without a trace. No noise, no explosions, one second it was there, the next it was gone. The original v.1.0.8 had a few problems that I had to fix so I just reupload the build about 45 minutes ago. Is this newest version the one you're on? I tried to recreate this but I havent been able to. The game autosaves after every herd and when you enter a dungeon so hopefully all was not lost. In the middle of the screen it blurs out but not on the outside. I have never came across this issue before, could you give me some specifics on your computer and video card? What happens when you turn off the blur from the options menu? Great find thanks so much for the feedback and support! I'll add this to the to-do list for the next update. I'll try to allow two doors next to each other but if it takes too long I might have to prevent the player from placing them together. 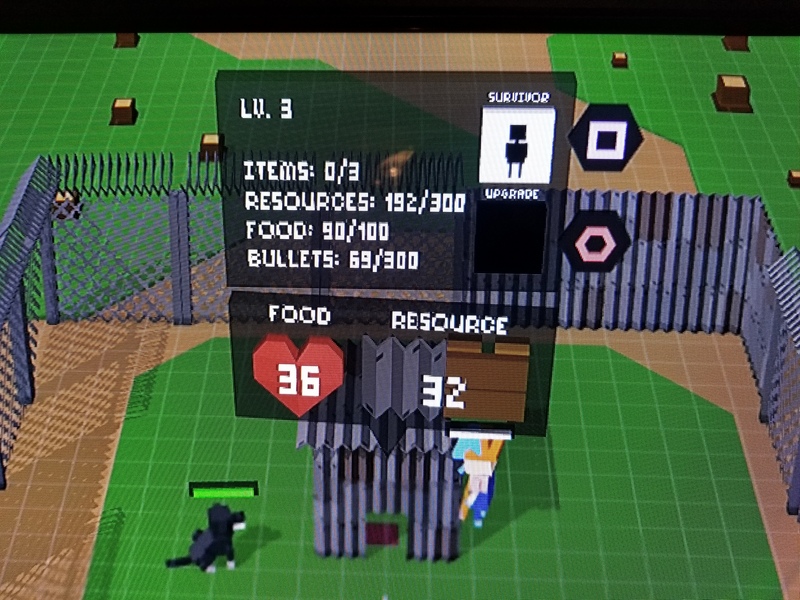 When you save, the Food and Resources held are saved together with the house resources and food. Fuel and bullets should be saving fine. I'll make sure that these are working properly and if theres a problem ill be sure to fix it for the next update. but when I play game found a bug ! Thanks so much for the feedback and support! really appreciated. During the tutorial the Mountain Man asks to build some walls, all you have to do is Hold Shift then use WASD or the Arrow keys to navigate to the Wall or Door and then press space. So sorry this is happening to you, I've been trying to figure out what can be causing this with no luck. You were able to press space for the tutorial and you can dash so it should be reading the space bar fine. Could you try skipping the tutorial and seeing if you can build? I just want to try and get to the bottom of the problem, I don't think many people get this problem. So far I don't see any real issues aside from two currently. 1. Lighting is messing up every now and than 2. Girl scouts glitch out when they hop into the truck. Also when I get a good paying job I think I'll throw $50 your way for developing the game further. Thank you so much for your feedback and suggestion, it's really appreciated. I'm trying to find what causes the Shadow glitch but I still havent found what causes it. Please let me know if you can recreate it in any way. I'll see whats happening with the Girlscouts they actually shouldnt be getting in the truck at all. The truck definitely needs some work, I'm just trying to fix the big problems first. Hi, Rafi. I've found some bugs in the PC version. I'm not using any cheats. 1) When I walk up to a set of spikes, the "Move" illustration appears, but it shows the Playstation buttons on either side of it, instead of "Q" and "E". 2) The tutorial gets stuck every time Herd 1 approaches. The tutorial guy says "Die you bastards!" but the zombies never appear. I've searched the whole "ring" I can walk around in, and all I can do is cut down trees, harvest mushrooms, or exit when I get bored. Having read the other comments so far, somebody had a similar problem when they "stood in the wrong place"; maybe that's what's happening to me also. - Instead of Space, use Enter to select anything throughout the game. If some people don't like this (and they might not), maybe allow both Space and Enter to work the same way. - Instead of Enter, use Esc to bring up the Pause Menu. - Instead of Esc, use some other key for committing suicide, maybe on the right side of the keyboard away from everything else, because players will almost never want or need to suicide. - Players in the Pause Menu will select things and then hit Enter to confirm. If they do, they will accidentally close the Pause Menu without making the selection they wanted to make. Thanks for the great game and all of your hard work so far. Like others, I'm planning to go back to your web site and donate money after I've played awhile. Somehow it's easier to determine what to pay for it after you try it. I usually play with a Ps4 controller so I didn't notice this problem was happening. Thanks for bringing it to my attention. Does this happen every time? The Herd spawns randomly and I'm guessing it spawned somewhere and they got stuck. I'll try and find whats causing this problem. Yea this is something that I realized quickly. I usually play console games so I'm not too in-tune with the usual Keyboard and Mouse Bindings. I'm changing Escape to be pause and cancel, Enter will be for Confirm like Space and Delete/Return will let you Opt-out. I'm working on the update now but my final thesis show before my graduation is getting nearer and I should really focus on finishing school first. Sorry if the car disappeared somehow. I put the car position in the save file so wherever the car is its actually saved there unfortunately. I'll add a reset car position cheat soon so you can try and salvage your save file. Once the DLC store is in the game you'll be able to summon any of the cars you have when something like this were to happen. Hopefully the problem is not with the map not showing where it is. Hi MUIFWEGO , have a problem in download : This XML file does not appear to have any style information associated with it. The document tree is shown below. I'm so sorry, I have no idea what this problem is. Could you give me some more specifics? at what point do you receive this message? Hey I've got a really good suggestion for the future. i think if you could impliment online co op or something similar it would help improve the game. Getting the orbs back to the monolith is the ending right now, all you have to do is return to the base to finish. the car saves at whatever position it was on save. I added that the zombies themselves drop bullets which has really unbalanced some dungeon rooms. I'm working on that, there are limits to how much resources and bullets you can hold now, based on the house level. Stone will be the next upgrade level land world material, then Bricks, then Steel. I also want to add a whole line of build items per house upgrade. Thanks for the feedback, support and suggestions, lots more comming very soon, Stay Tuned! Soo... after my base got wiped my towers stopped firing at all they just stand there and do nothing, I got everything to max level but still didn't fix it, does towers consume food or bullets to fire or mine are really bugged? PS: Awesome game you guys have, keep up the good work :). I'll Make sure they reset properly after the base is destroyed, you can try entering and exiting the cave to reset them. If you can try that out and let me know it would really help. I added it to the list and will make sure its working properly for the next update. - If the wood from trees and ammo don't disappear that fast it would be great. If you could take this into consideration it would be great. Yea I was thinking the same about the disappearing resources I want to make the resources not disappear as long as you can see it. You are right about that I'll make sure to change the spike collider so that the ammo doesn't get out of reach. I tried downloading now and didn't seem to get any problem. Can you try downloading it from inside the itch.io app? Fighting in the second level of the church. 2 Bugs and a few suggestions. - (Not sure if it's intentional) Level 3 and 4 Fences and Doors' textures feels backwards. (The Lvl3 has the Grid and Barbed wire fence but Lvl4 is just metal sheet. - Better handling for the car? - Faster firerate for the towers depending on level. The Girlscout is super fast and ranged so i think it helps to balance her a little. The chainlink is supposed to be weaker than the steel plates. They're kind of like the walls of Alexandria in the walking dead. The new update has a completely new Car system and a new 3rd person car camera you can toggle with L3 or Command. I kinda feel the towers are a bit over powered at the moment and a faster rate will just mow down everything. I'll try and see what I can do about that, maybe just a slight increase. All of those guns and more will be available soon through paid DLC or with in-game bones. Thanks for your patience, feedback and support, Hopefully you enjoy the new update. its a drastic next step. Okay this is a huge bug were the truck when you leave and go back in it tells you the truck is at its starting point try making were is tells you were is actually it is or whenever you go back in it re spawns to is starting point. Hopefully the new update addressed this issue, I tried making sure the position is saved. There is a whole new Car system and much more in the new update. I added a Reset Car Cheat in the new update and much more. There is a whole new car system and a 3rd person Car Camera. The controls are really twitchy with mouse/keyboard, and movement is so fast that it can get frustrating while trying to make small movements. May I suggest a 'Zoom/Slow Toggle' button/key, which doubles the view while halving the character's movement speed? This would make placing objects, melee fighting, and driving the truck sooo much easier. A larger pickup range would be very helpful, as would doubling the time objects stay on the ground before disappearing. Trees tend to explode into planks that fly all over the screen. I'm assuming that this is a bug. To fix the multiplayer problems I had to remake the whole input system. Hopefully the new Mouse/Keyboard set up is better for you. If not I can try to add some rotation sensitivity. On the next update I'm adding a precision button while placing that would stop snapping into place on just stick to the grid. In the new update pickups dont disappear unless they go off screen. The planks do go crazy sometimes I'll try to tone them down. Thanks for the feedback and support, I really appreciate it. Please check out the new update I hope you like all the new changes. You guys are awesome! Parsons, woot! Just found one bug though, if you drive the car off the bridge and into the water, you get stuck. If you log out and if you get back at camp, but the car stays in the water and you can't swim to it or jump off the bridge to it. Logically it makes sense that you lose the car if you drive it off, but if so, you need to either be able to get the car after you run through the city down by the river, or get into one of the abandoned cars (and you can only have one at a time so no switching cars all over, and that would give players incentive to not destroy every car for scrap metal). I have to start over because there's no way I can do the city on my walkies, and so I either have to function without a car or start over with no survivors. Thanks! Thank you so much for your feedback! Parsons! Theres a new update with a brand new car system and 3rd person camera mode. Theres a garage in the city where you will eventually be able to find some cars and motorcycles. the DLC will also let you buy/change your vehicles. This is coming very soon, stay tuned! Really amazing game, I found an annoying bug. - The farmer, if you don't rescue him the first time, you can't rescue him anymore. Chopping all the corn means that the next time you try rescuing him , you can't because you already chopped it all and it doesn't respawn after destroying the "blue globes". If you could make more clear how some game mechanics work, it would be really appreciated! There are some bugs with the camera too, but they aren't really annoying. Thank you so much! Oh wow I didnt even notice this was happening. it's a really easy fix and I shouldve added it to the new update that is out if any other small bugs are found in the brand new update I'll patch it really fast. The game is still missing some little cutscenes and narrative moments to really explain what is going on hopefully as soon as possible. Though I also enjoy some uncertainty in what to do sometimes. This still has yet to be fixed, would love the farmers addition to my team. In the latest update, I am unable to play using my controller at all. The only thing I can do with the Xbox controller is to scroll up and down in the menu and to move my character around (once in game using the keyboard). I'm also unable to join the game using the another controller to play in multiplayer. In the 1.0.8 version, I am able to play perfectly fine, so I know the issue is with the latest update :) Please fix this soon! Thank you so much for the feedback I really appreciate it. I had recreated the player manager and input system to fix the multiplayer issues and really have mostly been testing the game on the PS4 or with a PS4 controller but you were completely right about the Xbox controllers. I just uploaded the fixed version for the Xbox controllers, at least I think I did as I don't have any xbox controllers around to test. Please try again and let me know if its working and if it is showing the right interface buttons for the xbox I would really appreciate it. For the cheats, you just have to be joined in and press each button of the sequence quickly. When I skip tutorial I don't get pistol? Also selecting objects in crafting menu is buggy with mouse and keyboard, as is placing them. I also can't switch characters, it shows I did in top left but my character is the same? I'm getting stuck in the tutorial. The old dude tells me to break the object for bullets but when I do, the controls screen comes up with the right click/left click info and then it gets stuck. It doesn't go away. The only way out of it seems to be to press the "option" key on my Mac keyboard, but then the control screen goes away and I am stuck and cannot move. 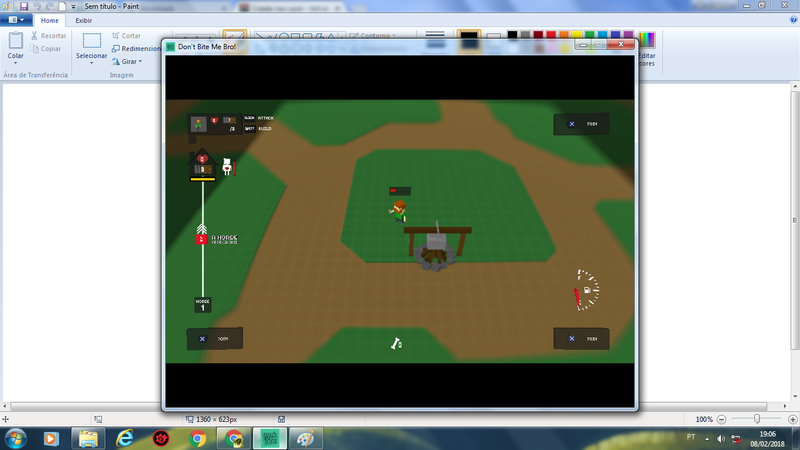 I still have the wooden bat, there are little yellow objects on the ground, and cannot aim/shoot. Using the mouse buttons just swings the bat around. I have not used any cheats at all, just playing the game normally and following the tutorial. I'm on an iMac OSX 10.12.5 if that helps at all. Sorry this isn't clearer you're supposed to shoot the bottles. You can aim and shoot using Right Click and Left Click or Ctrl and Left Click. Actually, I just figured it out. For some reason, aiming isn't working with the mouse, it's fine when I use the ALT key. But pressing Right Click to aim does nothing. I'm not using the Apple Magic Mouse, it's a standard non-apple wired mouse, so it should be working. But isn't. You are so right. So sorry I am so late with a response I was so busy with the Playstation build and DLC I didn't even notice this simple problem was happening after the update. I assumed it was working. I accidentally set Right Click to R1 instead of L1 which is Aim. I added your username to the credits of the game, along with everyone in the community that has helped out. I'm just fixing and finding bugs untill it is approved by Quality Assurance. If there is anything else you found, please let me know, it would be greatly appreciated. Thanks for your time, Sorry for the delay. Hi, the game is awesome but I have some trubles with the coop function: when I press the X button on the joypad it simply does nothing. Am I doing something wrong or it's a bug? I bought this game mainly for play it with a friend. Please help me. I'm so sorry I wasn't able to respond sooner. I really hope you was able to figure it out. To use a Gamepad and the Keyboard you have to: Connect the controller to the computer before opening the game, Join in with the Gamepad first then Keyboard. This way the keyboard joins as a second player. If you join with the Keyboard first the GamePad just controls the same player. I've added your username to the credits of the game. I'm just finiding and fixing bugs right now, for the Playstation release, new content, and DLC. there is a lot posted here. And my question may already be answered, but here goes. I just want to know if it's normal for a GIANT blue zomb to spawn? I have had one per herd since herd 21, and the last one actually spawned inside my fences already in the process of attacking my base. My trusty Cujo was there to nom his face but still that could have been a disaster if i had not have been close with Cujo. I think it's normal. This happened to a youtuber too. So sorry for the delay, I've been so busy. This is not supposed to happen at all lol. I've rewritten alot of those systems so hopefully I was able to fix this. I'll keep testing it out. I added your usernames to the credits of the game. How are you doing, guys? I would like to congratulate all of you for the funny game you made. It makes me nostalgic, as I remembered kind of the feeling I had the first times I played Zombies Ate My Neighbors (1993). The game visual and the dialogues lines are really good. So, as Portuguese translator, I thought about translating the game content into my language. What do you think about localizating it? It would be nice to work on it! Anyway, best wishes for all the team! Thank you so much for your support! I just release a massive update to the game along with a DELUXE version that includes the DLC that will be available on other platforms. We can definitely use some help with translation but its still a bit away as there is a lot still left to do before. You're welcome. I always get happy when I find titles that have this kind of fun. Oh, I didn't know about the deluxe release, that's great! So, whenever you decide to spread it widely into other languages, feel free to contact me, okay? It would be great to help in the translation process. Hey guys love the game but found a game breaking bug. I was clearing the hospitol when I got hit by a special zombie and it knocked me behind a wall leaving me completely trapped and no way to save since i havent saved in awhile ;( and the only solution i can think of is reloading the game. Thank you so much for finidng this bug, so sorry you had to experience it. The good news is that the game should save when you enter an indoor area. Bad news is that any progress inside the hospital is lost. I'll look into a fix for it. do you know what kind of wall you passed through? was it a hallway? When ever i come out of a dungeon or a building, the camera first starts at my base and quickly moves back to me with a tons of noise like wood falling really loud (but that may be lag). Then another time my camera randomly got stuck in a over head view but it was fixed when i restarted the game. When ever a horde/herd attacks, 1/3 of the time it says that there is one or two zombies left when there isn't any. When i got all three of the orbs and i went to the monolith, the went in but my HUD disappeared and nothing happened and i couldn't interact with anything. Some suggestions- Make so the flashlight doesn't turn on in the first stage of the hospital because there are already lights, Make the AK47 less OP. This is great feedback, thank you so much for your support! I'll try to fix these as soon as possible. The flashlight suggestion is great, the hospital first floor was darker before so it makes sense to not have the flashlight on now. I'll also take a look at the other characters not shooting this should definitely not happen. There is no Direct Message on here but if you email me at info@muifwego.com I'll try and get you a key for the deluxe. I have found some more bugs. I was in the city and i was driving my truck and i ran into a car pile-up and my truck got stuck. You should make the cars taller. As a school kid i couldn't talk to the trader and now i cant store my wood/food in the stockpile and i doesnt save. i cant put two spikes going in different directions next to each other but sometimes it works. in dungeons sometimes my bones get stuck halfway up the wal and zombies on fire tend to clip through walls. I don't know if this is a glitch but in the old church dungeon, when there is a circle of candles, i get hurt if i touch the side of the candle. When i turn off the blur the center of my screen is blurry. Some suggestions: Have the shopkeeper not have duplicate items in his store. Please make the inventory storage go evenly to 100 not 99 (but u don't have to). have the shopkeeper not sell keys that you already bought. Have an ability to regain the default character weapons after you save with other weapons that you bought/obtained. Add a boy school kid because why is there 6 girls and no boys when you rescue them. Be able to upgrade the fences in the farm area. Be able to move the storehouse to different locations ( ex: You can choose as an 1 out of 4 places where to start the game). And maybe in the future when it is on steam, be able to receive different costumes for characters. Also the crocodiles and/or alligators cant be killed and they don't move but they have zombie sounds. All the characters sound the same ex: school girl grunting like a man. Make the grid (the squares on the ground) an option and/or have it appear when you are placing structures, traps, etc. Also the hospital dungeon was pretty hard because the spaces to move in very small usually. Thanks for all the feedback! these are great.
" I was in the city and i was driving my truck and i ran into a car pile-up and my truck got stuck. You should make the cars taller." Because of the physics there is a bunch of places the truck can get stuck in, if you click in the Right Stick (R3) or press R if on the keyboard the truck will reset to the nearest road. I'll try and add an instruction text when the car can't move. "As a school kid i couldn't talk to the trader and now i cant store my wood/food in the stockpile and i doesnt save." This should definitely not be happening thanks for letting me know I'll look into it.
" i cant put two spikes going in different directions next to each other but sometimes it works." There is a system to auto-snap the pieces while you are building. I added a "precision" mode you can activate while placing an object that will stop the auto snap from happening. I believe its Right Stick Button (R3) and Alt or CMD on the keyboard. I'll make sure to add some kind of instructions for that. "in dungeons sometimes my bones get stuck halfway up the wal and zombies on fire tend to clip through walls." The randomness of the dungeons and the rooms leads to alot of wierd things happening. The plan is to recreate the dungeons after a few updates so that each possible room is actually crafted and tested instead of randomly put together. The goal is to make each dungeon almost a standalone rougelike game like binding of isaac or spelunky. "I don't know if this is a glitch but in the old church dungeon, when there is a circle of candles, i get hurt if i touch the side of the candle." "When i turn off the blur the center of my screen is blurry." "Some suggestions: Have the shopkeeper not have duplicate items in his store." "Please make the inventory storage go evenly to 100 not 99 (but u don't have to)." "have the shopkeeper not sell keys that you already bought." "Have an ability to regain the default character weapons after you save with other weapons that you bought/obtained." The weapons didn't save before the last update, so this is a new problem. I'll look into a way to fix this. You can always opt-out and lose the weapons you've collected but there should be a nicer way to solve this. "Add a boy school kid because why is there 6 girls and no boys when you rescue them." The schoolgirls are supposed to be girlscouts that were selling cookies. There are designs for lots of characters coming up, including a school kid boy. "Be able to upgrade the fences in the farm area." "Be able to move the storehouse to different locations ( ex: You can choose as an 1 out of 4 places where to start the game)." Originally the game allowed you to move the house wherever you wanted but this caused all sorts of problems with the hordes and it was also posible to delete the house alltogether. I have some pretty fun ideas to solve this but it's something that will most likely make it into a sequel of the game. "And maybe in the future when it is on steam, be able to receive different costumes for characters." "Also the crocodiles and/or alligators cant be killed and they don't move but they have zombie sounds." Yea, the crocodies are supposed to act more as environmental hazards. "All the characters sound the same ex: school girl grunting like a man." All the sounds of the game will be revamped, and voice actors will do the voices to the characters in update 1.2 after launch. Just focused on gettting the game out first. "Make the grid (the squares on the ground) an option and/or have it appear when you are placing structures, traps, etc." "Also the hospital dungeon was pretty hard because the spaces to move in very small usually." Once the hospital rooms are designed individually a lot of these problems will go away. But with the new roguelike systems It will be difficult to get through without some upgrades. Hopefully it wont feel cheap, but satisfying. I had this same bug and i know how too make and i figured out how to make it happen. Keep the file because your base can never be destroyed because there is no base. BTW people, i found a ton of bugs that i post in the Deluxe bugs and suggestions. If you want to you can try to see if i already found the bug but since i posted a ton and you only found one you don't really have to. On ps4 if you save and then quit, you can't access the house to press circle or square. Also the in app purcheses don't do anything. No bugs yet but I do have a few suggestions. (1) Have NPCs do "work" in home base (HB). HB feels and look empty, it`d be nice to see other survivors (that you unlock) becomes NPC and do some work around HB. I dont mean a whole new system where you pick and choose who do what (that`d be cool too) but just let the NPCs animate as if they`re doing work i.e. tending crops or fixing something. (2) A system where you pick one (or more) Survivor(s) to be a "Guardian". He/she will help you fight the Approaching Herd (while the other NPCs runs back inside HB. (3) A Buddy system. You bring at least one NPC on your adventure (Solo only). (4) Vehicle types. A sedan can carry 1-4 people but a bike can only carry 1. Also, I just wanna say; its a very fun game. I cannot wait to see what your game will become in the future! I play on ps4 and my truck disappeared in the city, the map shows that it is still in the city but I can not find it. Hey, I like the game. It has a lot of potential. With continued updates - especially pertaining to new zones/towns, dungeons, & side quests/characters to unlock, I can see it being a pretty captivating game for a horde of people (see what I did there? Ha.) - Discovery of spontaneous new things is key to keeping things entertaining. Here are a few bugs I have come across and some suggestions - I am on the PS4 version of the game. 1. Some time into the game I noticed I was unable to upgrade my house or swap out my characters, preventing me from progressing much further. The menu was not appearing when I stood by my house. - I noticed a previous comment saying this was an occurrence after you save & exit and return to the game. 2. When you die in a dungeon on a lower floor, you spawn in with another character - typically all weak ones if you haven't been able to upgrade them, where the level is more fit for an upgraded character. It doesn't make much sense why they would be spawning into the dungeon and not back at base - after all, they never ventured in to begin with. If anything, a choice window should be given so as to not walk your entire team to their deaths in a loop unwillingly. 3. When the dog returns to base it has nearly no HP for no reason, making you not want to leave him behind and waste resources (This happens to other characters when you are not using them as well). It also It also gets in the way a lot and makes you blocked in. I would suggest, if you try to walk into it, it will flee a few feet from you and return to follow mode, giving you a window to walk out easily. And it has some kind of super powered strength to throw cars into the air when it walks underneath them. 4. The holes to descending dungeons should ask if you want to descend or not. Sometimes I'm being hasty and fall in accidentally, when I haven't explored the rest of the floor yet. 5. The vendors should ask if you want to see their wares, rather than automatically pathblocking you. Those pushy salesmen! 6. I know alligators were meant to be environment hazards and thus immortal - but I think it would be better that, maybe they should just have higher than average HP, and perhaps respawn every 5 waves or so. 7. The car seems to automatically start backing up when you enter it. Not sure if that was intended. 8. When placing fences, you can offset them(which is fine, but -), when you place them at a fence to connect( in a "T" shape), the offset block goes through the other fence. (Making a "+" shape) -- not a big deal, but would suggest making it shave the end of the fence off enough to connect as a "T", and just start it new again on the other side if people wanted to make a "+" shape. 9. People have suggested being able to move your house - and you mentioned you would be making specific locations - I think it would be a neat concept to keep your old base, and be able to just have new ones added. Alter the horde waves to be happening at a random bases as a surprise, so you have to rush over to that base. Make it happen slower so that you have some chance, though. - alternatively, you can build up a base strong enough that the characters you rescue can fend it off themselves, but slowly weakens. Get notifications if a base is starting to fail. Have multiple bases being horded at one time. (Offset timers that can sometimes land in the same timing for both/multiple bases). If you set your unused characters to upkeep certain activity (farming, repairs, etc.) Then you should be able to successfully defend on all bases. Or maybe if you made zones going out super far, the base you are furthest from (or closest to) will have the most intense wave out of the bunch. I would also suggest new events and situations to occur in place of the typical horde, so that fending off waves doesn't become too bland and repetitive. Anywho, that's that. Good work thus far, Fun and addicting. I was hooked right off. I just started playing, got about an hour in, saved and quit. Came back and everything was fine. I then went to try some of the cheats because they seemed fun. In game they worked, saved and quit again. When I came back; however, there was no base, no walls, no gates, no house. The load screen shows the progress but in game theres nothing to play with. I am playing on a Mac computer. i bought the rifle with bones and it dosen't fire the bullet is taken but it dosen't shoot out and it dosent damage anything. How do I get my baseball bat back after purchasing a new melee weapon from the bone merchant? I thought I hated the bat untill I had the sword. Also when your crafting and accidentally make a fence you don't need there is now way to delete it. Hey Rafi, PS4 user here. Optimizing the aiming for console would take this game to the next level. In my opinion, its the only thing holding this game back. Best of luck. - Several survivors are not appearing on the map, nor when I search each sector. - During the farm mission, after I had harvested all available crops on the farm it was still telling me to collect and the mission would not complete. - I've accidentally run over and killed the bus lady, will they regenerate? Dungeons- Zombies walk through walls and objects such as rocks in the ancient cave and the church. In the ancient cave, I had reached the second level and did not come across the opening for the third level. Using the Hobo survivor, at the hospital, I blew the boss outside of the area through the wall. Open World- During the horde phase, some zombies appear and glitch through the map. Weapons- The uzi and the rifle have bugs. When used they act as if no ammo is rendered. When shot, ammonition is consumed but no rounds exit the weapon. That’s all I have for now. If it can be fixed, that would great. It’s an intriguing game and it can always get better. Taking the time to create an account to make one important post. Who ever thought that DualShock 4 motion control for the build menu was a good idea; slap that person in the face. It's like trying to hold a tray of ice cubes while having a seizure. PS4 user here: I was able to upgrade my base once but longer, I'm at the 12th horde and now my base won't take in any food either. Just gave the new update a play. Zombies are still clipping through our fences. When our house was damaged the HP bar on the left went off the screen into the negatives but nothing is happening and now it won't accept resources or food. I am having the same problem with food not being accepted on PS4. As well as many other bugs. In the tutorial, it didnt even show me we had a gun? So i played and died for a long time! Also it does weird glitches when you die. It just shows me a black screen and i have to push a bunch of buttons to switch back to the house. For a long time, it didnt let me choose the girl character as an option. And it glitched pretty badly when i was playing with anothwr person and we both died. It won’t let us revive, showed multiple black screens then the join screen, then if you pushed X, it would go back to a black screen. This game seems like it could be pretty fun, but as it is right now, it is unplayable since you cant gather any food, or rejoin after dying. Playing on PS4 version, as pre-mentioned. Tried new update, still getting a bug where after you save and load your game, the base(main house) is no longer showing its interface, and so you can't upgrade any further or change characters. Most likely won't be into the game until that is resolved as I've had 4 play throughs encountering the same issue and so it kind of breaks the game for me in progression. Other issues is that placement of objects is still very finicky, and often is pathblocked where things should clearly be able to be placed. As if the character is getting in the way of it or near objects, even though there is nothing on the tile of placement itself. There should be a tipnote about your HP dropping every so often when your food resource is dry. I noticed it myself and understood why, but some friends were wondering why their health was draining for seemingly no reason. The wandering merchants seem to still act as sudden roadblocks. The concept itself is fine but there really should be a button to show and hide their vends. Entering the game from a save file still puts you and your dog at low health for no reason. That's all I've encountered this play through, though I stopped pretty early on as I was mostly only checking to see if the first bug I mentioned was resolved yet. I found a bug on the PS4 version of Don't Bite Me Bro! With three players, the third player starts their play, they move a short distance and disappear as if they've died. Their character selection comes up, but instead of creating the player again, if you repeatedly hit the X button, duplicates of that player's choice will show up. 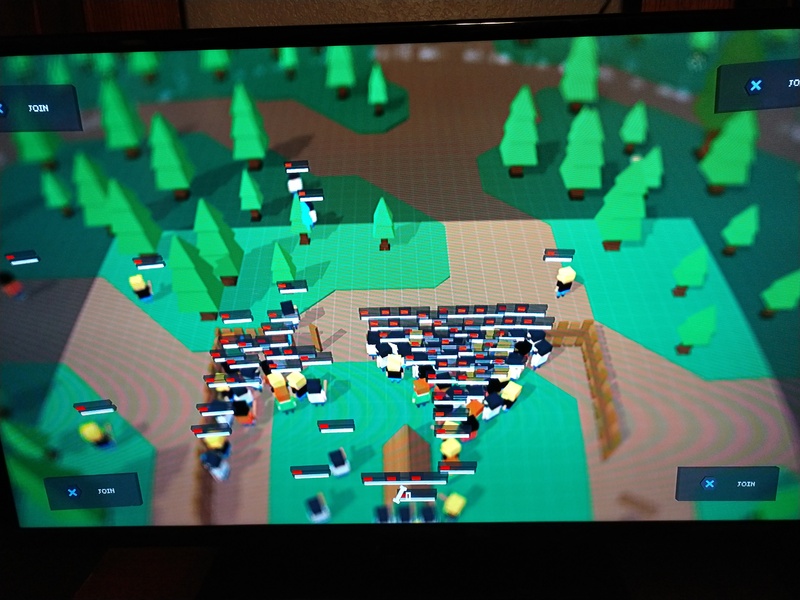 The new army of the third player is controlled by the third player as a whole. They all move the same direction, they all attack at the same time, etc. etc. There is some flickering on the screen as well. I've removed all save data, uninstalled the game, redownloaded the game, created new save games under different accounts, etc. We are on the latest PS4 OS. If there is anything else that we can try, please let us know. Is it normal for the fast zombies to turn invisble? Something about not registering 4th player correctly if there's no 2nd or 3rd. PS4 version. Eventually, characters would spread through the world, allowing Player 1 to travel at will. Tried to kill them... Well, it just gave them life. True zombies, I suppose. Perfect! Thanks for posting the vids. It shows exactly what I was referring too. If you add a day/night cycle, you should add a stalker zombie. Its hard to see, but it is slow and does lots of damage. playing on the PS4 multiplayer. Typically 3 people but I don't think this issue is limited to 3 people. Whenever you leave a dungeon the game glitches and all but player 1 must leave the game to recover. For hospital and cave the game centers on the base. For the school bus player 2 and 3 disappear off the screen. Playing on PS4. When I load up a save I either can drop off material but cannot upgrade the base, or I have the button to upgrade but cannot drop off material. I'll take a pic and try to upload a video. Sorry if this is a repeat issue. You cant upgrade anymore, that is the max level. It's supposed to do that. Other than you not being able do drop off material. I feel cheated out. I bought your dlc vehicles and I can't use them. Wtf. Either fix this or give me my money. This is on PS4. I'm on PC and i got the dlc and it's working. it is most likely a bug because the devs would never do that on purpose.This game has many bugs in it. Hello!!! I just bought the game today and I'm already running into issues which make it very hard, if not impossible to play at times. These problems mainly occur when I'm playing with other players locally, however there are some single player problems as well. When playing locally with other players, it's possible for the other players to spawn multiple times somehow when outside at the base. This leads to confusion since these other spawns do not disappear and can be controlled as well. When numerous spawns are on play, it can cause huge lag. Apparently when 1P (Player One) pauses the game when playing with other players locally, one of the other players has control of the menu. This is very frustrating, as I want to be able to control the menu when I press the pause button. This only seems to happen when I'm outside/not in a dungeon. It appears as if the aforementioned problems happen when the *displayed controls* for local players change from the remote controls to the keyboard controls (hope that helps). Besides some confusion, this really doesn't do much. When a local player joins/spawns, his/her character display won't show up like it does for P1. When moving between dungeon rooms, a local player will be left behind when P1 moves to a new dungeon room. This can rather annoying since you have to clear out any enemies in the room before you can then go back to the room which the local players were stuck in. A temporary fix for this is to have all local players move into the room which P1 is going to go in, before P1 does. However I do not want to have to resort to this everytime I play with other people. When a local player moves towards a soup bucket and presses the "EAT" button, it can cause them to be removed from the game/despawned. (Not a bug) When a local player dies, I have to go all the way back to the spawn in order for them to be able to respawn. Although this may not be a bug, I believe it'd be better if the player would respawn once/if the room gets cleared. Maybe I'm sounding a little lazy but I think this is a necessity. Referring to issue #2, when local players request to summon a weapon or vehicle outside, the witch always appears at the base regardless of where the player summoned the weapon or vehicle. However no vehicle or weapon gets spawned either. This is very annoying since I want my friends to be able to equip the weapons I've purchased with actual money. Some of the dungeon rooms allow for a player to get stuck/become immobile. This occurs when no/insufficient room is given when a player enters a dungeon room and is by an unbreakable object/structure. They get stuck between this object and the boundary/border that is placed to prevent a player from leaving the room until all zombies are killed. No jump button? The lake just below the outside base often causes a player to get stuck. It can be difficult to access the stairs for some reason, but I think a jump button would fix that. If there is one, please ignore this. Very Poor Customization: Not sure if this is a bug, but I strongly dislike the lack of customization I'm given for my base. Games like these should have stuff like decor (decorations), unlock/upgrade menu/tree. And just a better UI in general. I'm also wondering how I can change the weapons for my towers? I've purchased an AK-47 and I'd love to be able to equip them with it. Also placing stuff normally grown in bunches, like Corn and trees, one at a time gets very repetitive and annoying. Give us the option to place em 5x5 or 10x10. Once again, I know those probably aren't bugs, but I still feel like that stuff is "bugging" me. Music? Seems like after 30-40 secs the music went silent. Sometimes I'm unable to edit/upgrade my base. That's it for now. I know this is just an indie title, but seeing as how it was good enough to be put on PSN, I do have some expectations. I've spent money on the game and have bought a variety of items. I want to see how far the game I've supported goes. I think it's pretty alright, just need a plenty of screws to be-tightened before it's outta sight. A list of stuff I'd like to see in the game in the near future in order of precedence . Night time/Weather effects. This would make the environment/game feel more alive. Base Menu and Overhead Build View. Survivor Tasks . Tasks which allow players to unlock more favors and abilities for their survivors. Lost and Found: Upon Death, the merchant will offer all items lost back to the player for a small fee. More Orbs or harder orbs: Obtaining orbs should not be this easy. A player will need to complete multiple objectives before he/she will be able to even launch the boss fight for an orb. Ex: Make it to herd/hoarde 20, have at least 5 survivors, and a level 2 base to be able to go and retrieve their second orb. Also, revealing the orb locations is pretty lame. It takes away from the overall surprise and sense of accomplishment a player would get if the location of the orb was unknown until seen. Hi! Great game, playing on PS4. Car got stuck on highway. Ran out of gas while I was transporting the drunk. When I got out of the car it was on top of the drunk so he could not move. Tried quitting and the drunk reset to his box. But the car was still floating. Tried car reset position cheat and it disappeared into oblivion. Kept showing on map in the same or adjacent square it was in, but no car. So my wife and I have taken a liking to this game and it's simplicity, so i figured i'd try and mention some yhings ive noticed as well and perhaps a few questions. -A big annoying one for us is resource inconsistancy between players. For example, many times i will find that my max capacity for resources is 300 at full upgraded base, yet my wife, as Player 2, will cap out at 200 for some odd reason. Also when we are in the dungeon cave, we will destroy the rocks to collect 2 resource per rock. However, when Player 2 or 3 pick up the rocks, their amount of resources held will not increase. She will pick up like 50 rocks worth of resources but it will remain as 0. They basically just go nowhere. It appears that only player 1's actually keeps them. Edit: this applies to all rocks. Not just dungeon ones. When i use any gun that isn't the uzi or pistol with the football player (for example the shotgun, assault rifle or hunting rifle) , the character pivots from the end of the gun instead of his own feet. To describe this more accurately, using any of these guns for a long enough time causes the football player to slide around the center point where i should be standing instead of rotating. Basically its depicting my character where he is not which you can notice by the foot step dust created where i actually am. I guess the best way to put it is using these guns makes the football player really annoying to use; i honestly think you should just not have the guns visible unless you fire them because its the running with the rifle out animation that gradually causes the players position to not match the actual visual of the character. The girl with the purse also has a skin where she wears a wgite dress with black hair, but the dress comes out pink. The kids do not match their skins at all either. And when i enter a dungeon or another area in general, the thumbnail depicting my character at the top corners rando ly changes skins. 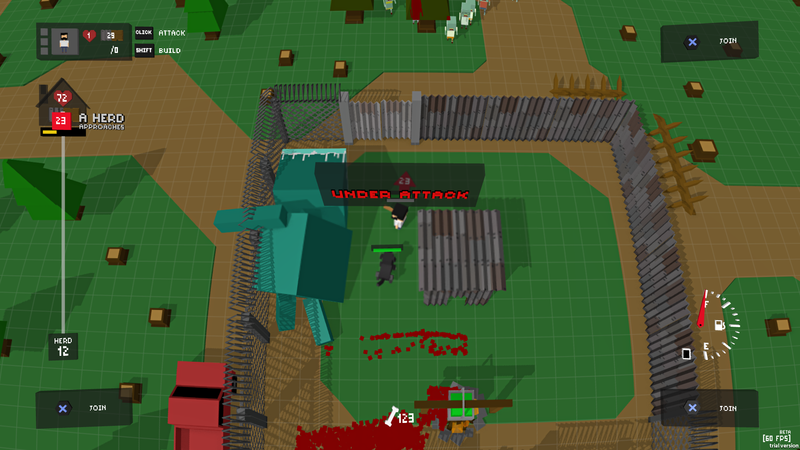 -Sometimes zombies will not stop spawning in a given area. -when a pregnant zombie pops out a baby and you kill the baby quickly, the barrier around the room will not dissapear, trapping you until you commit suicide. -sometimes the barrier will appear at the wrong time and one of the players will be locked outside of the barrier. A sinple fix for this is to just make it so it only Acts as a wall one way. So if you walk i to it from the outside, you can get in but not out until all enemies are defeated. This bug is especially common during the boss fights. -when your food is at max capacity in your base, it should not still take the rest of the food you're holding. So if im holding like 50 food, and the base is at 99 food, it should only take 1 food from me, not all 50 when the base caps at 100. That just means 49 food goes to complete waste. -the dog shouldnt lose all it's health EVERYTIME i see a loading screen. -the close combat weapons like the nimbus and katana either need something to explain their use or have their cooldown times reduced. Because honestly i dont see why they are worth 100 bones when they are generally too slow to be remotely useful unless again, im missing something. When our corpses become zombies, the should be nore diffixult to kill depending on the upgrades and amount of things we had. And we should be abke to get a portion of what we lost back if we kill them. Like 1/3 of our resources, food, ammo and one of our items at random. And even then only a chance to get it back. Also how do you beat the stone boss with the force field? Ill have more soon, phone's dying. I believe you gotta destroy it's surrounding stones / storm arms or whatever . Destroy both then the orb will drop. Also how long does it take just to get a reply? hey i just downloaded the game and its amazing i really like it but i have faced bugs and im here to report them so the first one is that sometime zombie go through wall specialy in the donjon second bug is when im in my base and press q the game freeze my guy and i cant take him anymore i have to get another guy but i cant go futher than my frozen guy vision and the last one is that exit buton dont work. I have metal towers and fences, wooden spikes around my base and I've rescued about 6 people. When I try to upgrade my tower, it says I need to upgrade my base. When I go to the base, it shows me the hearts and resources only, it won't let me upgrade the base beyond the large wood shack. adding a way to drop an unwanted weapon would be great! on ps4. In multiplayer. When the second person joins, as soon as they select character it acts as if you didn't join and wants you to choose character. You can spawn hundreds of charecters but as soon as you try to upgrade or eat, it closes you out like you held triangle. Its showing press q or e to eat but I'm on ps4 not pc. I play the game on the ps4, I don't know if it makes any difference , the first day I play the game it worked fine. But now the upgrade menu won't appear. If I make a new save file it will pop up again, but when I shut it off and come back the next day, it goes away again! Also, when another player joins, the man gets all stupid and doesn't work. That's all I've seen so far, otherwise I love the game! Hello, i have noticed that the dog is often pushing me into zombies or stopping me from going through doorways, it would be much appreciated if you were able to walk through the dog. Also is there any new information on multiplayer? Thanks for reading! the achievements for the 3 dungeons/cave/church/hospital are broken on steam so no matter how many times i redo them i don't get achievement and those are the last 3 i need T_T. Relase date PS4 STORE EU? Hola, soy un nuevo jugador y encuentro muchos errores en mi computadora portátil. No puedo guardar mis recursos en la casa. So i play on the playstation 4 and sometimes when i attempt to play local multiplayer, the characters will infinitely spawn without the ability to hit or they will despawn. I tend to end up with 20 characters along with the original character.